Keir takes on Gears Of War: Judgement's multiplayer, and finds himself disappointed with some of the changes that have been made. The Gears of War multiplayer experience has had a fairly checkered history. Despite a strong following developing around it, it wasn’t until Gears of War 2 that Epic was able to craft an experience to rival giants of the arena such as Halo and Call of Duty. GOW2 introduced the now much copied Horde Mode, where players face increasingly tough waves of enemies. With the exception of this brilliant mode, the GOW2 multiplayer, though solid, still felt a little tacked-on. A serious shift in focus towards online features came with the third instalment of the series. Gears of War 3’s campaign was now the portion of the game that ended up feeling surplus to requirements. Epic added a very well received tower defence mechanic to Horde and unveiled Beast mode, where the larger, non-humanoid Locust were playable for the first time. With all the play modes from the previous two games included in their original form or combined to create new ones, the Gears of War 3 multiplayer suite was about as good as you could hope for, and I’m still playing it. 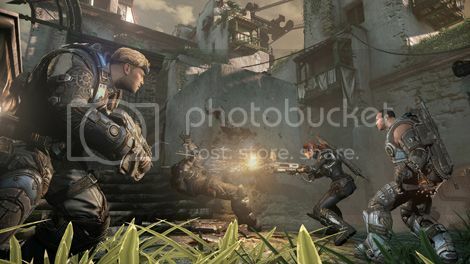 Epic and People Can Fly made quite a bit of fuss about Gears of War: Judgement's new game modes: Free for All, Survival and Overrun. Some basic changes have been made to how you play, and unfortunately none of them really improve the experience. Most might not be noticeable to first timers and may actually bring the game in-line with other multiplayer standards. In Survival you play as COGs defending three strategic points on a map, one after the other, as you are pushed back by the Locust - these are bots just like in Horde Mode. You have to defeat ten waves before all three strategic points are destroyed. The maps are pretty cramped, so the action is intense but it’s a real shame that Survival has replaced Horde. As enjoyable as it is, it's fairly disposable and the defence of the three destructible points feels a tad gimmicky. Overrun is very similar to Survival mode, however this time there are no bots and all online players alternate between playing as teams of COGs or Locust. This is just as much fun as survival but again wears a little thin after a while. Within Survival and Overrun, a new class system has been introduced for the COGs. You can choose from one of four types. As an Engineer, you have the ability to repair barriers and throw up un-manned turrets, as a Soldier you carry one of the new Booshka grenade launchers and can throw out ammo to help you and your teammates. The Scout class arms the player with a semi-auto sniper rifle and clever ‘spotting’ grenades which show up the enemies’ position. Finally the Medic class gives you ‘health grenades’ which you can use to revive teammates when they go down. The class system works really well when everyone on your team picks a different type and works together but, as anyone that’s ever actually played a team game online can tell you, this happens rarely. As a result, most of the time the classes end up feeling a little limiting and the Locust aggressors, be they human or bots, always seem to have the upper hand. For me the most disappointing aspects of the Gears of War: Judgement multiplayer are the changes they have made to the more basic game modes. In previous instalments players have always played as teams of COG versus teams of Locust. For some reason in GOW:J this has been scrapped in favour of a rather simplistic red vs blue (snore) ,with all players appearing as COGs. There are some options to pick a particular character and skin design but again these options feel far less important than the last time around. GOW3 featured very aesthetically pleasing character selection screens, with large portraits of each character. In terms of presentation in the character selection, menu and stats screens there’s been a decided step backwards, with a look that reminded me of Epic’s original multiplayer powerhouse Unreal Tournament, rather than what we’re used to in GOW. So, despite a couple of interesting new additions to the raft of game types and the brave introduction of a class system, the Gears Of War: Judgement multiplayer experience in the end takes away more than it brings to the table. Epic and People Can Fly must be commended for trying to strike a new path in the Gears of War universe in both narrative and multiplayer. To be fair, with the deep changes that have been made to the structure of the single player experience it would have been jarring to keep the Multiplayer the same as earlier games. The Call of Duty franchise has managed year on year to fool us into thinking they make sweeping changes to each instalment of their online game, when in actual fact the alterations have been subtle tweaks to a winning formula. It's a shame that just as Epic had properly established a solid framework for multiplayer, Gears Of War: Judgement makes the mistake of going full tilt with the refit, rather than making a few small changes to keep it fresh without altering too much of the core experience.